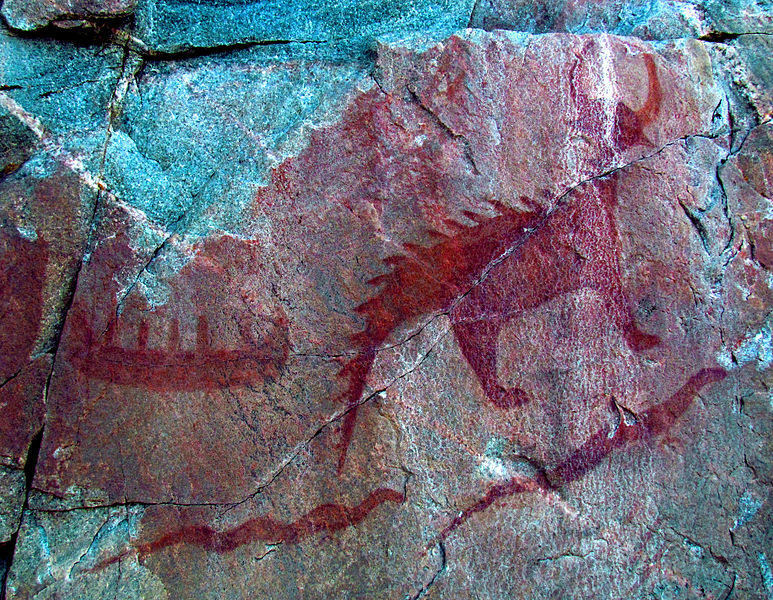 Agawa Rock, Lake Superior pictograph. Canoe and Mishibizhiw, or Great Lynx who controlled Lake Superior and, below, two giant serpents called Mishi-ginebikoog in the Ojibwe language. Estimated to be 150-400 years old. There was a period of time, in my twenties, when I was eager to quash the stories that supposedly told me something about our family history and culture. My reasoning was three-fold. First off, what culture? As a Gen-Xer, I obviously did not have (or need) a culture. This was a meme that I had thoroughly accepted as one of the defining characteristics of my generation. It didn’t reflect my upbringing, but it was an easy way to walk away from my youth. A corollary to this was that the stories which came down through my family began to seem absurd and embarrassing. They were the same stories that everyone seemed to have, the sort where everyone’s got a Cherokee great-grandmother or is descended from a Chippewa chief, not to mention the adventures of famous ancestors and fortunes won and lost in the Klondike. My stories began to seem cliché ­– not culture, just dusty fiction. It also seemed easier and safer to deny an innate sense of culture when expressing myself as a French Canadian meant confronting a chorus of “who cares?” In the university milieu, cultural studies meant an era of hyphenated identities, mostly predicated on visible difference. The study of culture meant the study of minorities, in other words, the study of cultures that were really cultures, not just throwbacks to the old days or to a rural life equated with backwardness. Fast forward 20 years and I find myself in a much more confident place with regard to who I am and where I come from. I am no longer dismissive of the stories I had heard growing up. I have spent a good deal of time over the past few years ‘returning to my sources’ – returning to family stories, returning to the long lines of history that comprise part of my cultural experience. One aspect of this renewed encounter has been, with the benefit of hindsight, becoming more wary of the easy dismissal of tradition – family stories, oral history, legend. All of these have a place in broader society, just as they help awaken us to the experience of the culture we are born into. It is one thing for a melting-pot society to lose track of the smaller subcultures that inhabit small pockets of North America. It is quite another to deny their existence, to erase their memories, to casually state that someone else’s history and traditions aren’t true or don’t matter. In my case, this point of view comes through actually proving one of my family stories, one that is current among many French Canadians. It is a story that came down through ten generations before facts resurfaced in the form of documents after 300 years. I was able to reach this point through a combination of factors among which were well-honed research skills, the ability to read French, and the ability to decipher 18th century scribbles. It wasn’t easy getting there. But the most important part of this scenario is the story itself. The story had always existed in my memory and it was part of our family history. In a family that had little of material value to pass down, that we had family stories narrating a connection to the distant past was invaluable. I know this because it was a story that continued to be passed down, even to my generation, when our culture seemed to be coming to an end. This story is important to me and I’m glad I was able to prove its veracity. But even if I could not have proven it, would that make it less legitimate? Would it be less an expression of my family traditions, of my wider culture? What If I had predicated my identity solely on this story and someone came along and scoffed at it, demanding absolute proof, labeling it fiction until proven otherwise through official documents? Although some people experience cognitive dissonance when faced with conflicting information, others are perfectly capable of holding two ideas and accepting the validity of both. I have another family story, about having royal ancestors, which I know is not true. Yet, I love the story. I found the story implausible even when I first heard it as a teenager. It took 30 years before I discovered why it was told, and figured out how it was not true. But in researching the matter, I spent a lot of time thinking about my late grandmother and her sisters. I spent time talking with my sister about it and doing research together to try to figure it out. When we finally uncovered the truth of the matter, I felt as though I knew the ‘story’ much better than I did before. And through this story, full of half-truths and mistakes, I felt as though my ancestors were much more real than I had ever conceived of them. Their lives took on new meaning and my connection to them became more than just a line on a pedigree chart. And, through this process, I discovered that hidden history and cryptic stories often contain truths, small and large. It is (partly) in these stories and their truths, whether we are conscious of them or not, that we find and experience our culture. Telling, adding to, and sorting out our family stories, even if we know some of them cannot be true, is part of maintaining our cultural legacy and deserves not to be diminished or silenced. I recognize a great deal in this, James, not least of which is the specific satisfaction of having proven family stories to be true through research, by piecing together the documentation. Your piece also touches on some very important matters such as the idea that French-Canadians are an invisible minority. Our story cuts across established racial orthodoxies. The invisibility of French North Americans, their status on the margins, is also implied throughout your piece. You’re spot on David. My feeling is that were we in Canada, our culture would be something that we were fighting for (‘we’, in the communitarian sense). Here, once people sublimate their heritage for enough generations, it becomes unclear to many people just what it means to have a heritage. This may be exacerbated in the Great Lakes region, and in the French communities in the Illinois country where the 18th/19th century cultures were much more heavily metis. 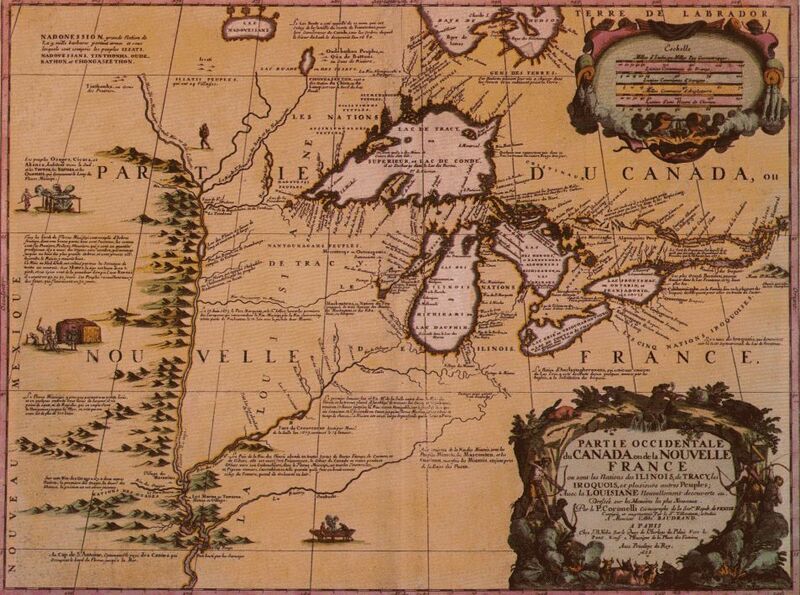 French Canadians weren’t just becoming invisible in the face of westward expansion by the Americans. They were also, I speculate, being considered much more like the Metis of Canada, French perhaps, but ‘savage’ nonetheless. Invisibility is also a survival mechanism. My feeling is, French Canadian culture is not gone forever, but raising consciousness is a slow process and not everyone is enthused about discovering a complicated ethnic past. Now I want to know the stories!